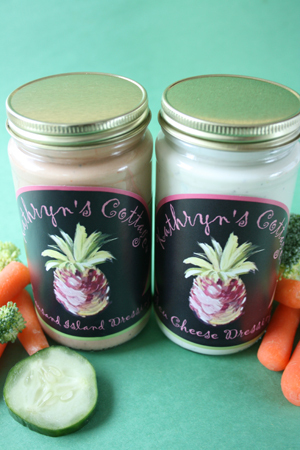 You can have a simple salad with blue cheese dressing; but Kathryn’s Cottage dressing so exceptional, it will inspire you to make creations like this (recipe below). Photo by SoulGems | Fotolia. WHAT IT IS: Blue Cheese Dressing and Thousand Island Dressing. WHY IT’S DIFFERENT: They’re the best we’ve found—even better than our own! WHY WE LOVE IT: One taste and you’re hooked. You’ll eat a jar as a main course. WHERE TO BUY IT: KathrynsCottageKitchen.com. CAPSULE REPORT: Little did we know when we opened the jar of Kathryn’s Cottage Blue Cheese Dressing that we would fall in love. We try every blue cheese dressing that crosses our path. Most don’t measure up. Funny: Kathryn was in the same boat, so she decided to make her own. After much experimentation, she came up with the current masterpiece; then developed a superb Thousand Island Dressing as well. If you think you don’t need to send away for salad dressing, think again! Or at least twist your retailer’s arm to stock up on them. Read the full review below. This is Page 3 of a four-page article. Click on the black links below to visit other pages. 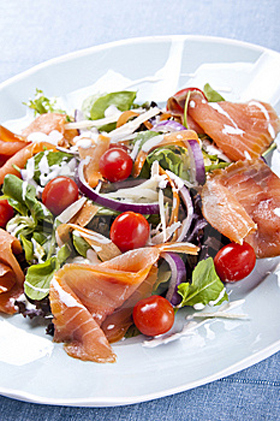 Try a salad of field greens, red onion, grape tomatoes and smoked salmon, drizzled with blue cheese dressing. Black olives optional. Photo © Garuti | Dreamstime. 1. 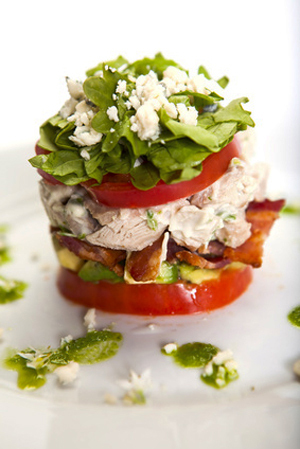 Build stack from thick tomato slices, cubed avocado, bacon, cubed roast chicken tossed in blue cheese dressing, another tomato slice and arugula leaves. 2. Top with top-quality minced blue cheese (break a piece of blue cheese into crumbs). 3. Garnish plate with arugula pesto: Place arugula in food processor with a small amount of olive oil and a pinch of salt, and some blue cheese (substituting for Parmesan), and process into pesto. Garnish plate with pesto and minced cheese crumbs. 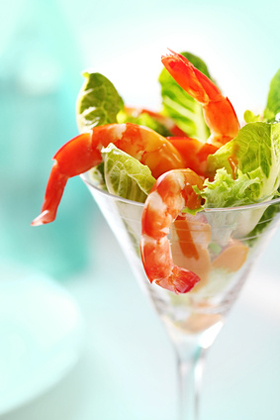 The new shrimp cocktail: A martini glass, hearts of romaine and Thousand Island Dressing. Photo © Robyn Mac | Fotolia. We want many, many bottles of these! Photo by Hannah Kaminsky | THE NIBBLE.